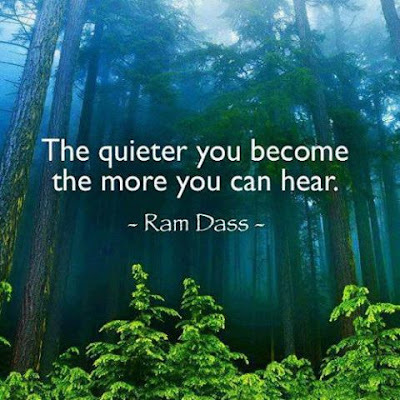 "The quieter you become the more you can hear." I remember my dad yelling, angrily, demanding that we kids shut up so he could get some "peace and quiet!" Sometimes his demand was even more desperate. "Just give me a moment's peace!" he'd plead. At those times, the threatening tone of his voice and likelihood of imminent violence usually did shut us up--at least for a few moments. Kids will be kids. Sigh. I ache now with the memory of his anguish and my own fear. I wish I knew then what I know now. I'd given him that moment's peace gladly -- out of compassion, not fear. I remember the day I looked out the front window of our apartment and saw him silhouetted against the sun sparkles of the small lake we lived on. He sat there in his beloved rowboat a couple of hundred feet offshore, fishing pole in hand. Dad could sit like that, motionless, surrounded by the stillness of that lake, just peering at the red and white bobber for quite awhile. He seemed at peace. He'd return to shore afterwards, seemingly in a good mood, calmer, quieter, more content. I noticed. Forty three years after his death, it is one of my strongest visual memories of him. After a heart attack, strokes, and uncontrollable high blood pressure, our family doctor had advised dad to retire and "just go fishing." At age 59, he did just that. 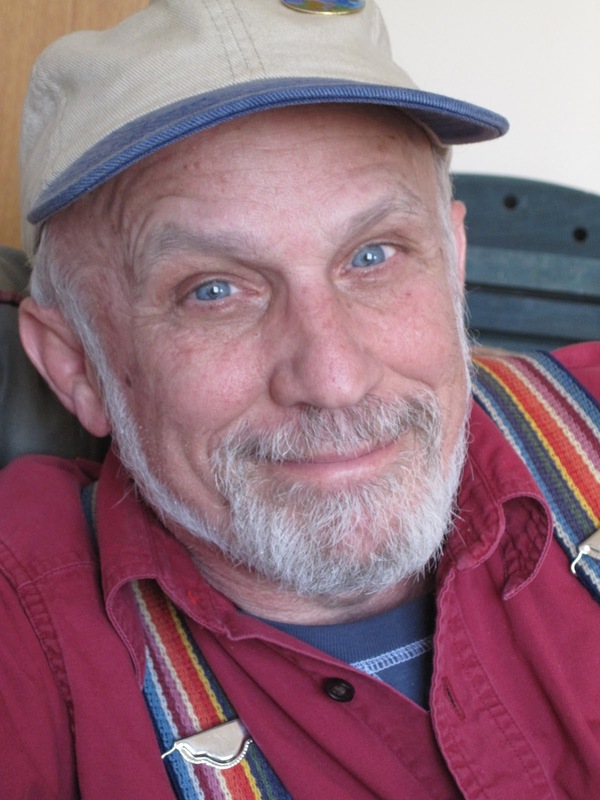 He bought himself a camper and a trailer, and for much of final year and a half of his life, he traveled and fished from coast to coast. I think the quest for "peace and quiet" is probably universal. Thich Nhat Hanh once wrote that even the businessman's smoke break was an attempt to stop and breathe, to find a moment's peace within the busyness. The promise of the Practice is that we can engage in that quest with some degree of skill. Built on a foundation that is centuries old, there is actually some method to our madness. As today's quote from Ram Dass points out, there are deeper and fuller realms of experience available to us. They emerge from the vast, tranquil sea of silence that we are immersed in. It permeates and embraces even the noise. As we cultivate Mindfulness, we are more likely to notice ourselves being calmer, quieter. The cacophony of random thoughts and feelings and bodily tensions tend to release their grip a bit, and a sense of silent spaciousness emerges in our lives. Yet--and here's where it gets interesting--we are also more likely to experience sounds and other sensations more vividly. As more time and energy are devoted to Mindfulness Practice, there will be times on the zafu that the volume knob on thoughts and uncomfortable feelings may get fully cranked to the right. Oftentimes at those points, our attachment to a model of "peace and quiet", will generate a level of resistance to that experience, and we will think we are having a "bad" meditation. That, of course, is not the case. In actuality, it may well be a sign that the Practice is deepening! At those moments, the courage and care we devote to staying with the Practice offers the possibility of healing our hearts and minds at deeper and deeper levels. With compassion and effort, as gently and diligently as possible, we choose to persist. Although it's not "easy," sometimes it can be as simple as letting go of the storylines running through our mind, then exploring and fully feeling what we are experiencing before moving our awareness back to our meditation object. If you choose to do this -- again and again and again -- at a certain point, you'll notice. The episodes of "noisy" patterns of thought and emotions have become less frequent and pass more swiftly. There is also another way, perhaps a bit more pleasant, that the volume knob can also get cranked up as we cultivate the Practice. It happened to me last Monday. 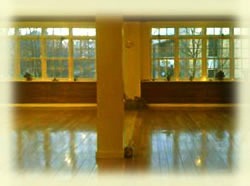 For those of you who don't attend Monday Morning Mindfulness, MMM meets at Community Yoga, a studio perched on the second story of a building half a block from the main downtown intersection of Greenfield, MA. Although there isn't much traffic as the Early Bird session begins at 7:15 AM, by the time the Monday Morning Mindfulness Circle gathers for our opening period of meditation, there is often a stream of stop and go traffic dancing the stoplights at the corner. At times, it can get pretty noisy. Yet, at one point this past Monday during the 9:00 Sit, a pause in the traffic noise emerged. Suddenly, it got quiet. It got really, really, QUIET! At that moment, what my first Zen teacher may have called the Soundless Sound, became deliciously and distinctly tangible. Then, as I sat there immersed in Presence, that ineffable sense of vast spacious stillness didn't dissipate as the next car approached. It persisted. The whirr of that car's engine emerged, peaked, and then slowly dissolved within the boundless silence. In that moment's peace, I felt the Presence of the One Love at the Heart of Existence. Now, as I sit here at this mac a few days later, I weep softly with feelings of both gratitude and grief. I'm grateful to the Practice for allowing me the precious opportunity to experience the "entire gamut" of the fragile majesty of our shared human condition. In my Heart of Hearts, my dad, silhouetted in sun sparkles is still fishing, finding a moment's peace, a couple hundred feet off-shore. Amazingly written! Thank you for sharing such a personal story. It touched my heart! You said: "Unfortunately, he suffered from atherosclerosis and cardiac disease. He had hit the trifecta." I counted two not three ailments. Was your dad into horseracing like mine? In some future article could you please expand on what you shared "In Both Sides Now?" I am interested in how you work with the resistances to continuing a sit. You didn't share any personal specific examples here, but that might help. 1. Genetic predisposition to dying young, through heart disease, etc. I'll take a look at "Both Sides Now" again. I'm actually going through a period where some resistance to my 1 hour morning Sit has emerged. I'll share what I come up with, either with a personal message or a new blog post. Isn't it wonderful to recognize the lesson, to have the memory of the teaching of the lesson in technicolor to play out in your mind? Finding harmony of thoughts and emotions in love are the true point of points in being here. The experiences we 'suffer' through or observe in others, are the teachers we need to be awake to absorb and learn. Such a blessing to have those classroom doors open in our mind, keeping them open is hard as we fall prey to confusion and frustration from daily living. I find I say out loud to myself, I don't know what I was thinking when I chose such a hard lesson this time around, but I must be up for the challenge because I recognize the lesson, so to turn my back on the wisdom of the teaching is to slack off on advancement in my eternal adventure and growth in the love of all that is. What a pissa! Boils down to....once you know, there is no going back. Enjoy the harmony that comes from the memory that was tough to see play out through young eyes of confusion. Being thankful for the memories is an electric blessing of consciousness I figure.